A few weeks back, I went to Portland for a few days — it's the first overnight trip I've taken away from the city in 2018. 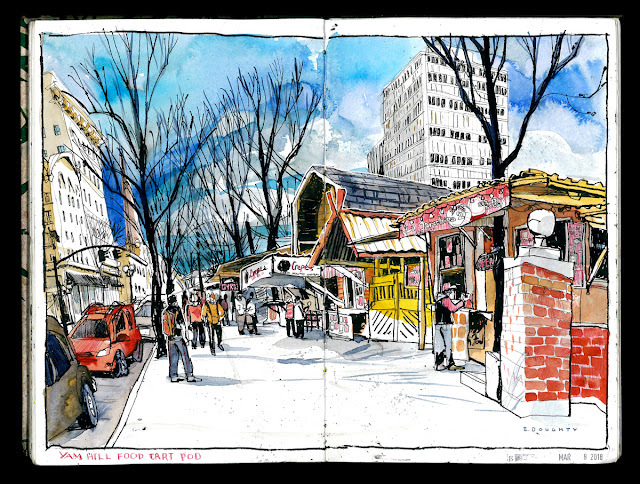 My partner and I were there to celebrate & hang with a dear friend for her birthday, and took a few days to explore the city, obviously sketching as much as possible. We were lucky to catch some genuinely Spring-y weather while in Oregon. It's not my first time in PDX, but it is my first time there after moving to the west coast. It really feels a lot like Seattle, especially architecturally — I definitely prefer our city, but PDX seems to have a better food scene (y'all can try to prove me wrong on this). Yam Hill Food Cart Pod | After our bus dropped us off in downtown Portland, and once the sudden rainfalls abated, we did some sketching by a food cart pod. A really great use of a parking lot in a dense urban area. I would totally get lunch at every cart once if I worked nearby; your stomach could travel the world in this one block. St. Johns Bridge | A lovely suspension bridge (in my opinion, not shared by my PDX host) from a lview we stopped to capture after hiking in Forest Park. Portland's hills are taller than Seattle's, but their mountains are much less dramatic (still very beautiful, just different!). The area across the river is super industrial, which I may have slightly edited away in this painting. St Johns was an important stop along the river during the lumber boom. Willamette Boulevard | On the way back from Forest Park hiking & St. Johns, we passed this huge old Victorian house which i LOVED. So later, we came back here and I spent an hour or so sitting on the side of a busy road painting while sitting in the dirt. What else could you want on a vacation? 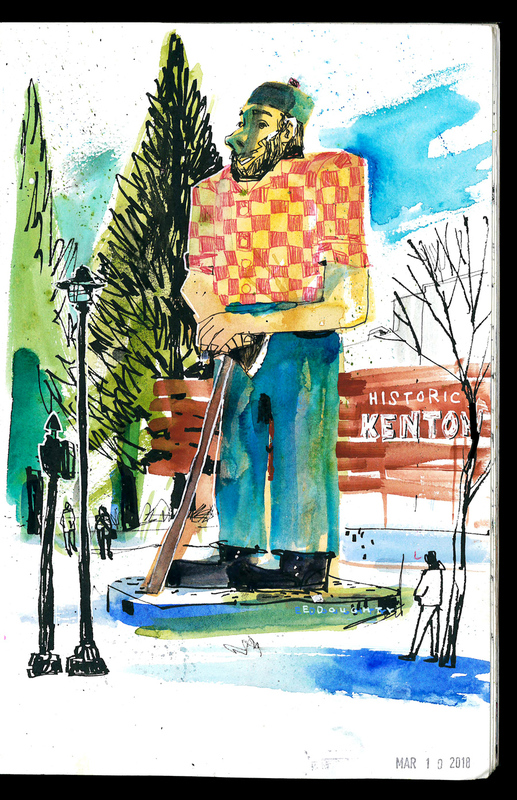 Paul Bunyan | As we were staying in the adorable Kenton neighborhood, we apparently had to check out this local landmark standing on a busy intersection. I appreciate the wonkyness of giant Paul at this intersection but his unfocused gaze and lack of neck definitely adds some uncanny aspects to this monumental sculpture. But yeah let's #keepportlandweird! 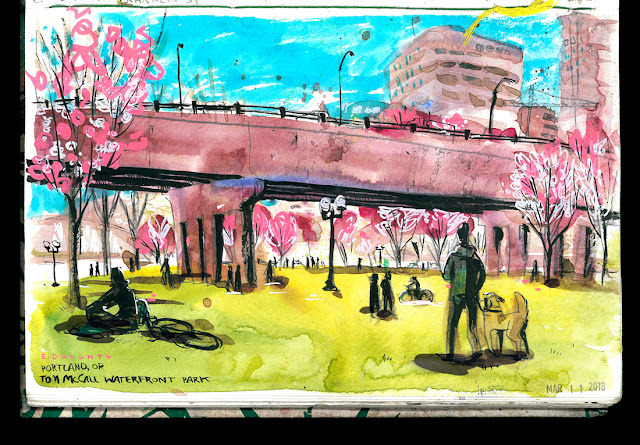 Tom McCall Waterfront Park | This was the first day all year that it felt like Real Spring (i.e. warm enough to sketch for a couple hours without my hands freezing) and Portland residents were out in force at this stretch of waterfront lawn. The cherry blossoms were also at peak bloom! It was a shame to have to leave to catch our train back to Seattle. Wonderful sketches!! 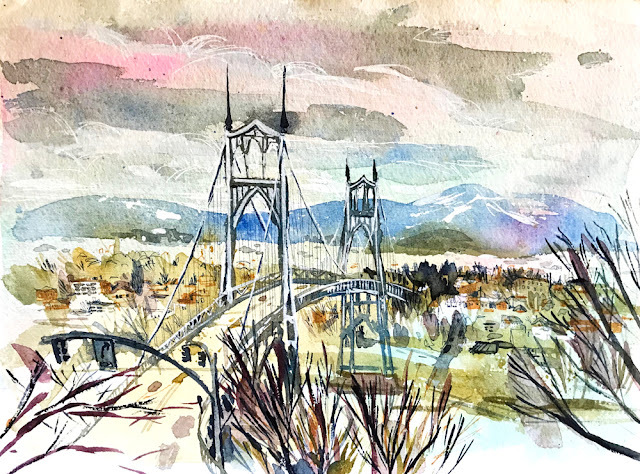 I especially like your sketch of the Saint Johns Bridge. I like that bridge, too. 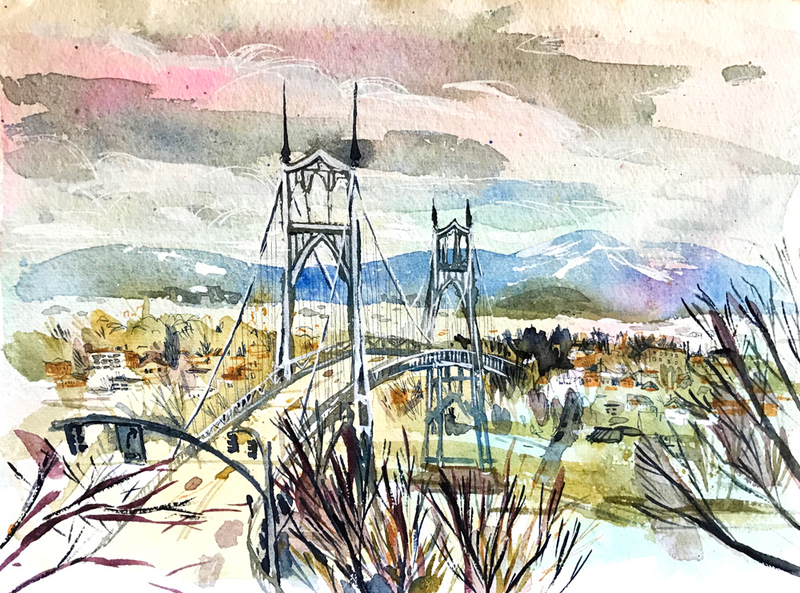 These sketches brought me back to those days when I lived in Vancouver,WA which just at other side of bridge. 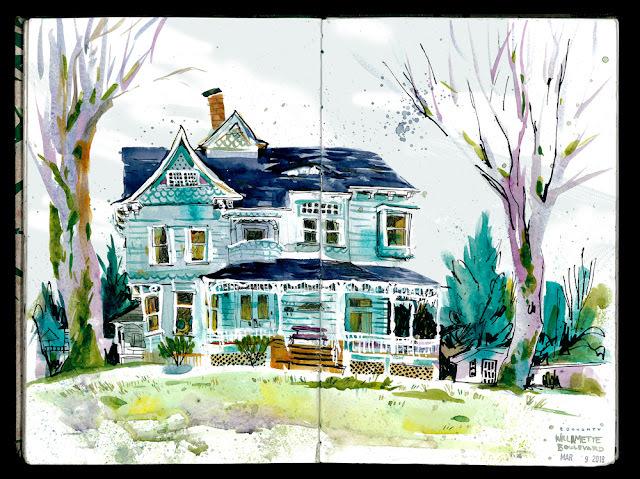 Love your brilliant watercolors! Thanks for sharing!